There are music videos for Neon Knights and Die Young. However, they’re just staged live footage with overdubbed music; they’re not conceptual. The bass line for Heaven & Hell was written by Geoff Nicholls. 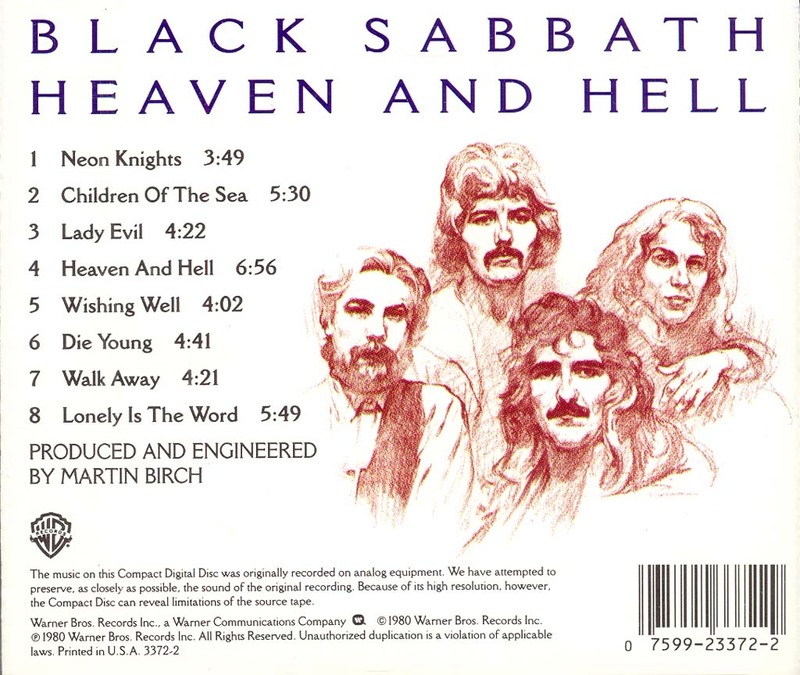 The Bass player position on this album has a tortured history. Right after Dio joined, Geezer left, and both Geoff Nicholls & Craig Gruber worked on bass (mostly Gruber from what I can tell) up until the point it was time to record the album. When Geezer returned, Gruber was gone, and Nicholls switched to just keyboards. Craig Gruber claims to have written “Die Young” while he was still part of the band Rainbow, and “brought the song with him” when he was asked to join. 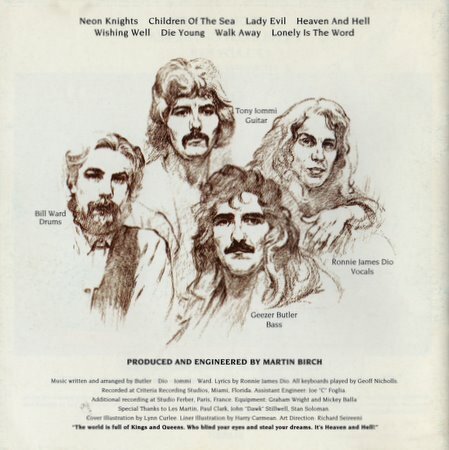 All the songs but one were written before Geezer returned – the only song that Geezer actually had a hand in writing was Neon Knights, which was the final song recorded. 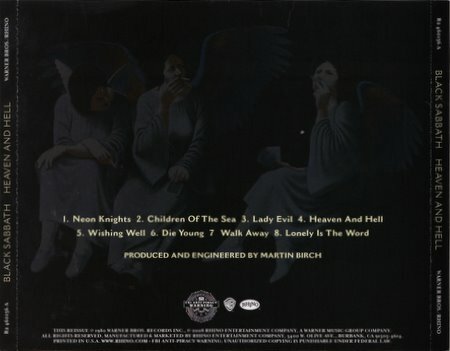 The song Children of the Sea was written in the earliest days of the project when Ozzy was still involved. Both Geezer & Tony have said in interviews, they have tapes of Ozzy singing Children of the Sea (with different lyrics and vocal melodies). That version has never surfaced. 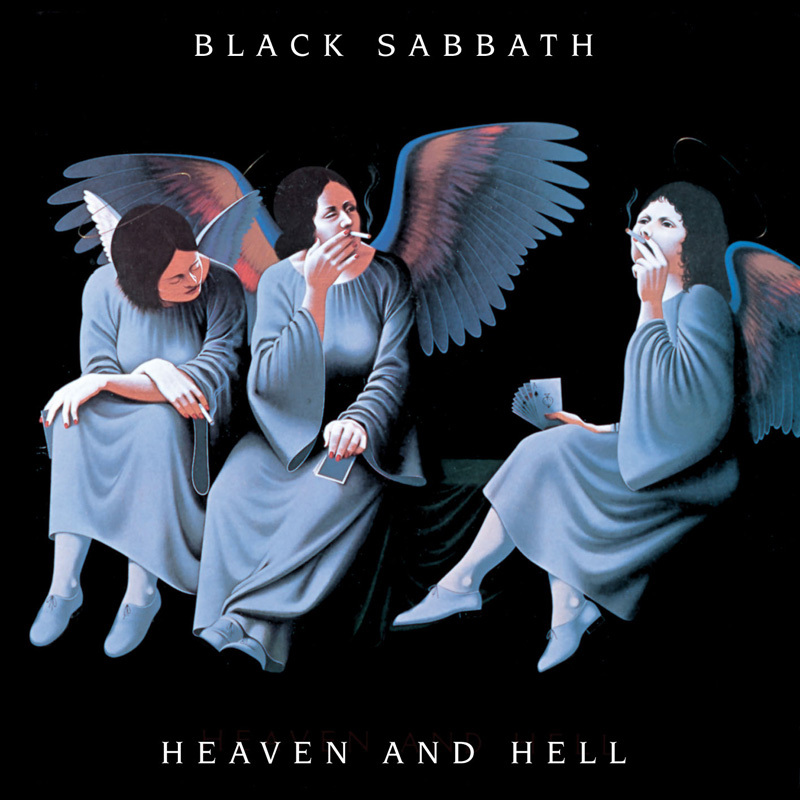 The cover art is actually a painting done by artist Lynn Curlee called “Smoking Angels”, and was not specifically commissioned for the Heaven & Hell album. In December of 2008, I published an interview with Mr. Curlee about Smoking Angels. You can read it here. 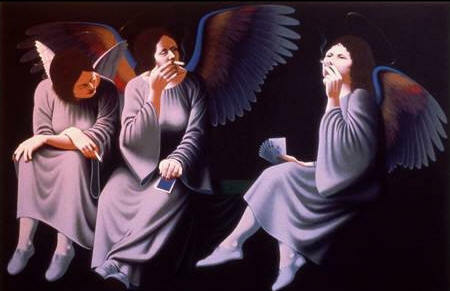 The following is the original, uncropped version of Lynn Curlee’s “Smoking Angels” artwork. This is the cover art and the back cover images for the 2010 “Deluxe Edition” CD release. 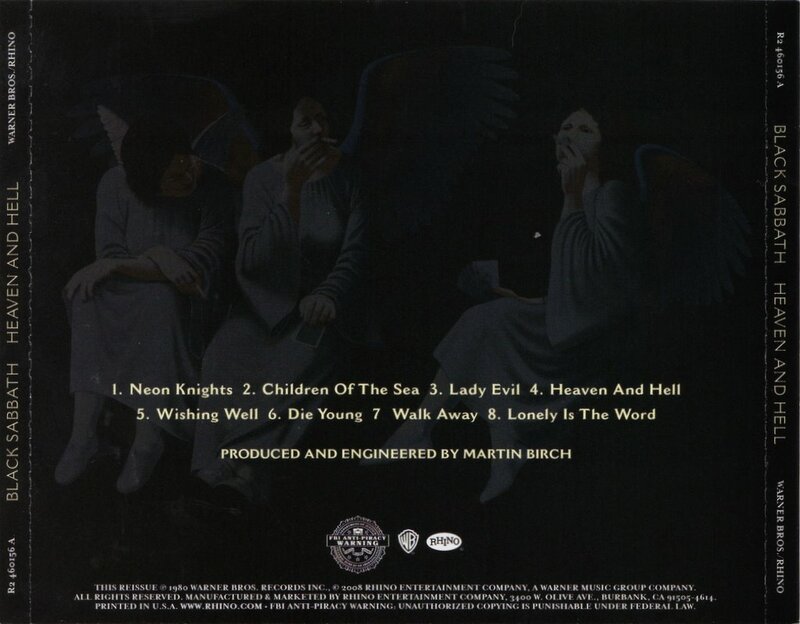 The following is the original back cover of the vinyl release (minus the copyright stuff all the way at the bottom). This particular image though is a scan from the 1996 Castle Remaster booklet, as I don’t have the true original vinyl to make a scan of. The following images are back cover scans of the original 80’s US Warner Bros release, the 1996 Castle release, & the 2008 Rhino release. 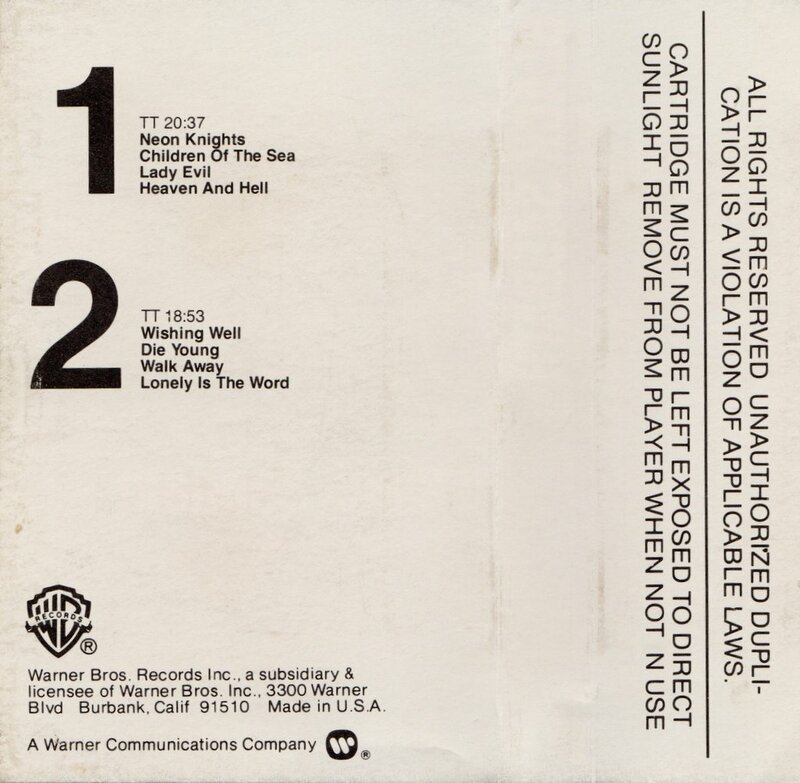 The following is a picture of one of the old style CD “longboxes” from the US in the 1980’s/early 90’s. Here are some scans of the original 1980 Warner Bros cassette tape release in the US. Finally, there’s this oddball, released in the US in the 80’s. 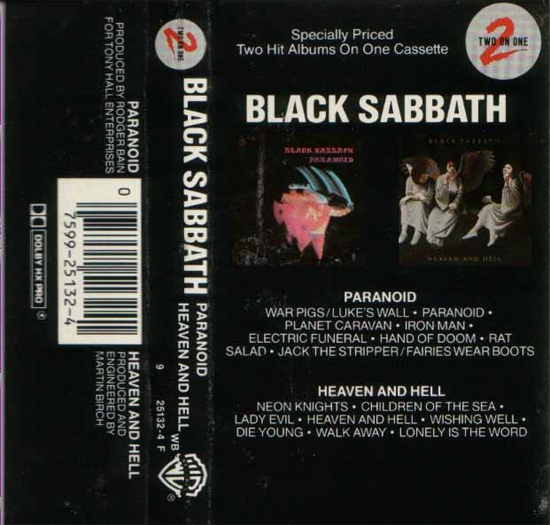 It’s from Warner Bros, and has both Heaven & Hell plus Paranoid on the same pre-recorded cassette tape. Look out, she’ll pull you in! And it’s on and on, on and on and on…. You’ll never get old – ha! Life’s fantasy – to be locked away and still to think you’re free you’re free, you’re free! Can’t you see the writing in the air? But don’t be fooled! just turn your head and walk away! I’m sure every Black Sabbath fan will agree with me when I say that this has to be one of Sabbath’s finest albums. All songs are absolutely brilliant. 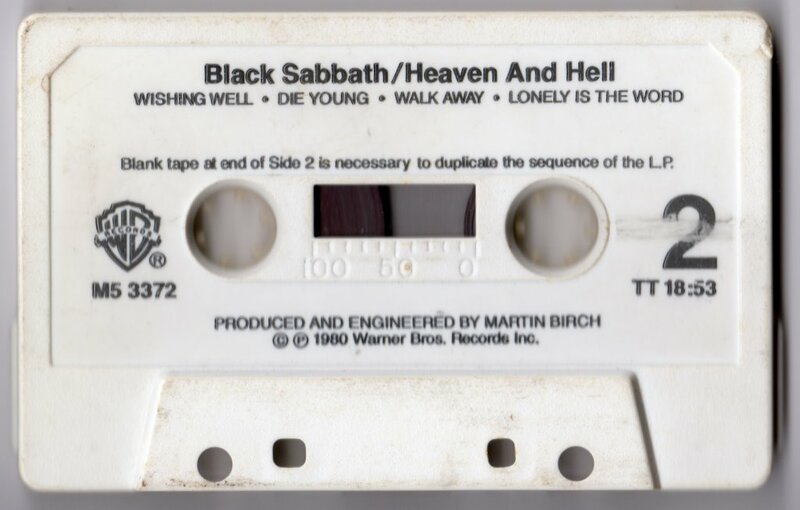 What’s amazing is that they could produce this strong an album right around the time they were producing (let’s be fair) not their best work (Technical Ecstasy & Never Say Die). Dio certainly breathed new life into the band, that’s for sure. And, too be fair to Ozzy, Blizzard of Oz did the same for him. As much as I love the original Sabs, breaking up was a great thing for both sides, and for fans. A perfect album except Walk Away,, which is one of the worst songs they ever did, and is an absolute misuse of the talents of the entire band. I wish Geezer had come up with just one poem and then they’d done a new song around that. Either that or take whatever poem Ozzy originally wrote for Children Of The Sea and redo the instrumentation entirely. These guitar solos, are probably the best solos Tony has done on a Sabbath album, along with the solos from the first Sabbath record. 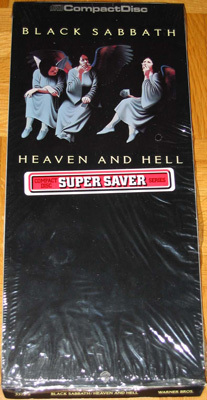 I like the other album titled Heaven And Hell better (2009), but only because there are more songs, and it would be the same with Dehumizer if there weren’t SO MANY REPEATED OLD RIFFS on that record. Notice they never played Walk Away or Wishing Well live? With Walk Away I understand, because, let’s face it, every other song on here is better, but Wishing Well is a wonderful piece. I think Devil You Know would have been a better album if Follow The Tears had been more bright and melodic like this record. I do wonder if the whole thing about the stolen songs and parts about this album that is written here is true. Because as far as I can tell, there’s no proof of that. But yeah they initial breakup was great, because Sabbath got a better singer and Ozzy got a better guitar player, and we got this album, Blizzard Of Ozz, Mob Rules, and Diary Of A Madman out of the whole thing. But it didn’t last long, because just after 2 albums each, Randy Rhoads died and Dio and Vinny quit. Thankfully Dio and Vinny went back, twice. Not so fortunate for Randy Rhoads. A lot of the singing on Bark At The Moon is so off because Ozzy was choked up with tears the whole time, he really should have taken a break. That and the guitar tone of that album is way too thin. It’s a good album, maybe very good, but not great. 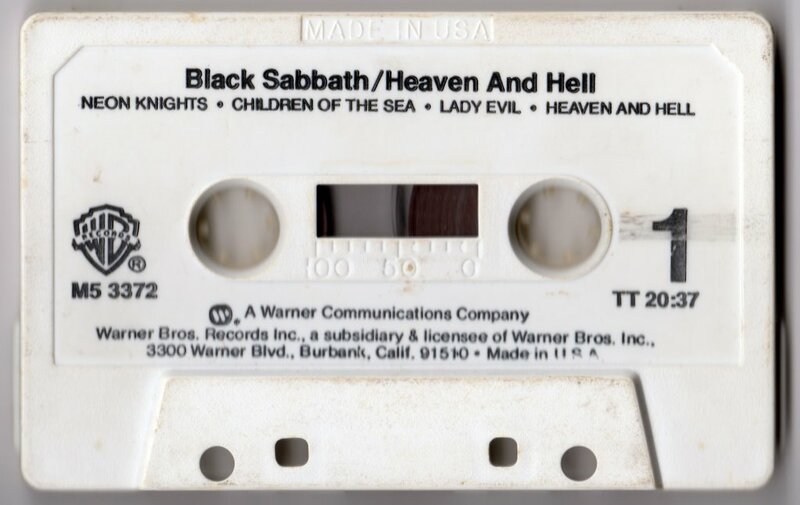 Thankfully in 83 we got Born Again and Holy Diver though after the disillusionment of the whole thing….. It’s hard for me not to think of Dio’s band when he has Vinny as Black Sabbath though, especially with what happened after Born Again and Cross Purposes…… but that’s another story. i agree with him. this album i love too! the cover art and the songs…. my god! top of the tops album! the powerful voice of mr dio, their slight change in sound. modern at the time fitting dios vocals. I love it! true work of art in my opinion. 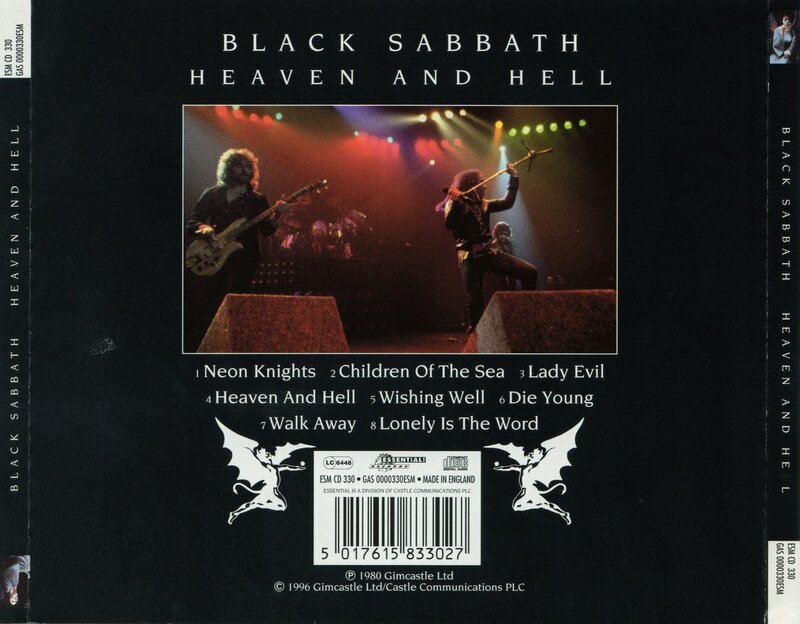 The studio tracks with live footage promo vids for Neon Knights and Die Young. I love the lyrics. They’re dark but still has a message that is very positive. For example the title track is maybe the heaviest song here but it’s about comparing the ups and downs of life and the final verse tells you to live life to the fullest. Certainly one of my favorite albums. RIP Dio. I love this album. Children Of The Sea is amazing. Heaven And Hell… Y’know what? 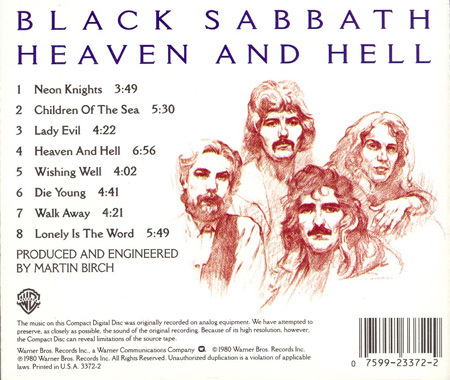 screw going through each track, this album is one of the best sabbath albums and best albums of all time. 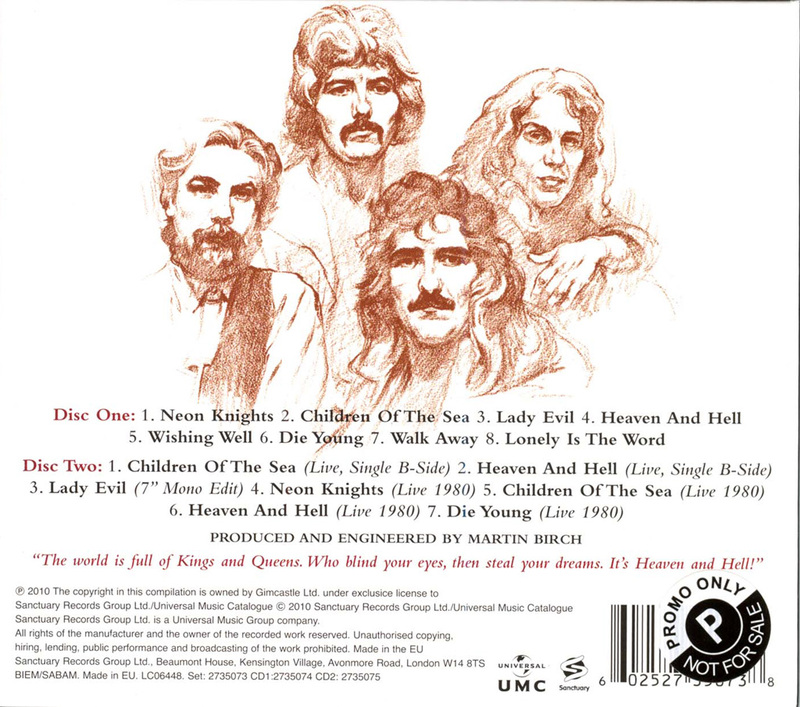 Dio is in top shape, Tony sounds refreshed, Geezer is amazing (as always), and Bill – I don’t believe he plays on this album. The drumming is too safe to be Bill. I do think he plays on the song heaven and hell, but other than that, I don’t believe that it’s him on this album. Other than that, I think it’s a masterpiece. The band’s first since sabotage. 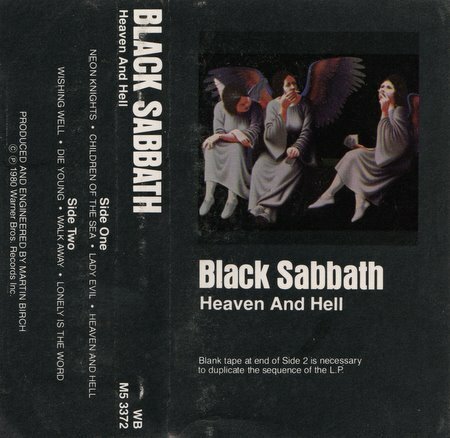 I first got into Black Sabbath’s Heaven and Hell album twenty years ago in the late spring of 1995. I was very impressed with Children of the Sea, the title track, Die Young, and Loney Is The Word. However, I think the entire album is a masterpiece! I remember being awestruck when I first heard Die Young. Its so powerful! I’m glad I had the honor of hearing Heaven and Hell songs live when I saw Heaven and Hell twice and I’m so glad the Dio era got the attention it deserves. Tony’s autobiography says they recorded a version of Children of the Sea that’s ‘very different’ to the Dio version, which is fantastic btw. Can someone with more influence ask Sabbath to retrieve and release this version please? 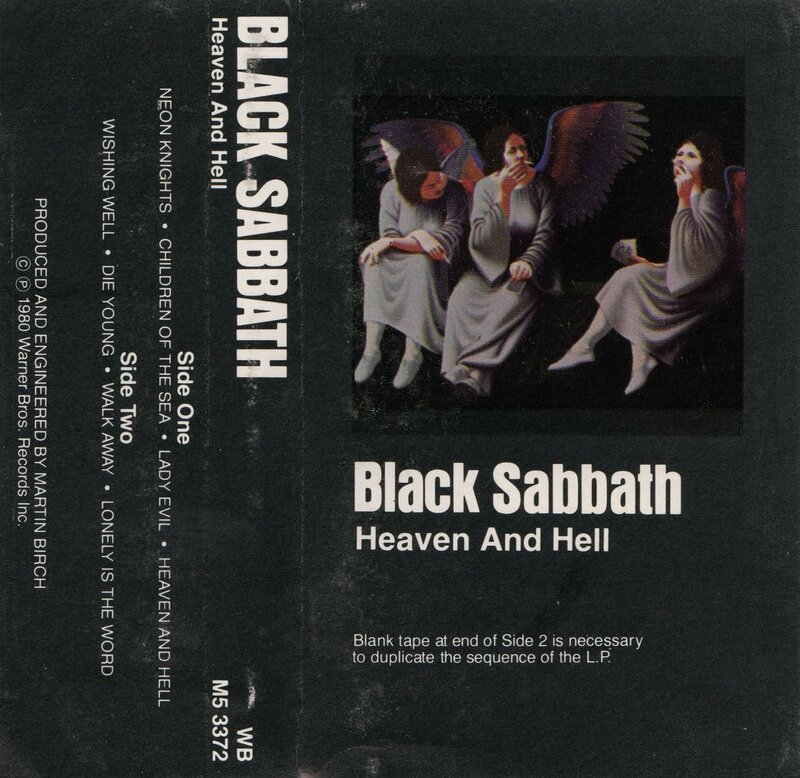 The song Heaven and Hell was one of the first Sabbath songs I discovered – already being a Dio-fan at the time – and I learned later that the whole album was equally good. One of my favourite albums of all time – part from Walk Away – just amazing! Where are these songs sourced from?